Here’s another one-minute pose I did last weekend at the special life drawing session at the National Waterfront Museum in Swansea, drawn outside in the open air in the new ‘Graft’ garden: CHILLY! Life models are stalwarts, so important to an artist’s practice and rarely acknowledged for the work they do. It isn’t easy. The drawing event was part of the Now The Hero / Nawr Yr Arwr arts festival happening this week in Swansea. Yesterday I posted about the upcoming immersive art event in Swansea in September – Nawr yr Arwr / Now the Hero. I will be exhibiting some of the work I have been doing over the past decade with a young , now not so young, soldier who is also a life model. I’ve been looking through it all and it’s a big body of work. 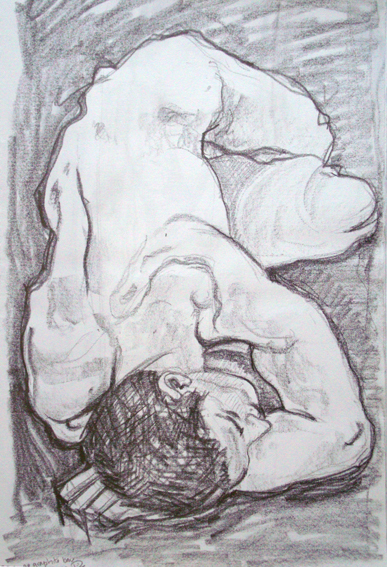 The starting point is life drawings, which I do most weeks at Swansea Print Workshop. From the hundreds of drawings I have in sketchbooks and portfolios, I select some for development, usually into original prints. This one started as a pastel sketch on a canvas sheet and I developed it into a full-colour monotype (see my Techie section for how to do it). Very early on, I started to investigate the idea of The Warrior and this is reflected in the work I’ve done. This was done near the start of our working relationship and it’s called ,”The Warrior Turns To Face The Darkness“. 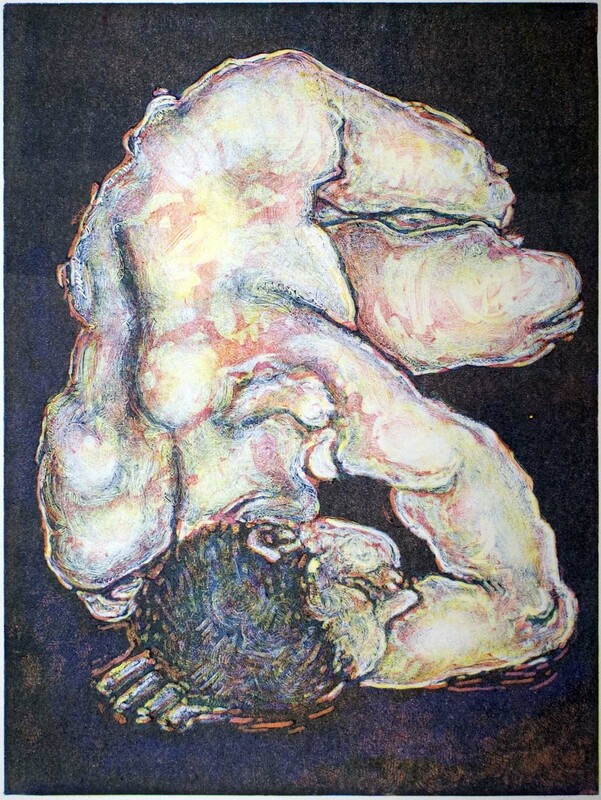 I did a small series of full colour reduction monotypes a few years ago, working with a young soldier I know who is also a life model when he’s on leave. He loves modelling and he’s really good at it. From an artist’s perspective, it’s fascinating to work with a man in the prime of life who is in the best possible physical condition, not overdone like a body builder but as fit as it’s possible for a human male to be. But apart from that, what resonated with me is the danger of his job. He loves what he does, which is difficult for me as I abhor war, but I also accept that some humans are born to be warriors and this man is one of them. And he is a son and a grandson and a brother, as human as the rest of us. 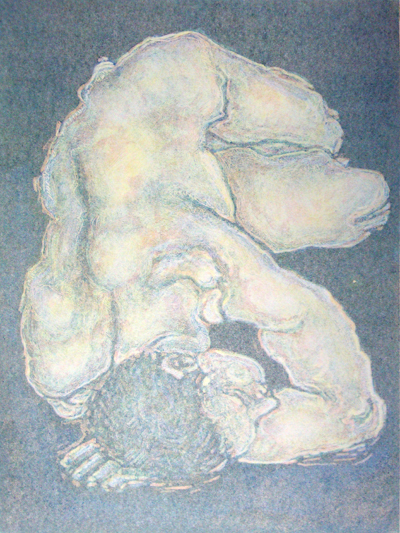 All my monotypes are based on original life drawings. I do many in my sketchbooks but only a few make it through to development into something else – a monotype, etching, screenprint, painting etc… When I chose the drawings to develop for the ‘Warrior’ mini-series, I focused on my own feelings and showed the vulnerability of the model. Warrior he may be, but he’s also fragile flesh and bone and his life could be snuffed out so easily. The full-colour reduction monotype process produces one piece with deep, jewel-like colours but I also put another piece of the gorgeous BFK Rives paper through the antique etching press at Swansea Print Workshop to take a second – ghost – impression. This technique was beloved by Impressionist artists Degas and Monet and they often worked over the ghost monotype with oil pastels. But often, the untouched image is quite beautiful without any more work, the oil pigments break up slightly like an Impressionist painting. If you want to find out more technical details about monotypes, please click here to go through to the technical section on my website. The “Warrior Prone” is available for sale on Artfinder and if you’d like to find out more, please click on the link here to go directly to it or click on the link on the right hand side of this blog to see other works for sale.